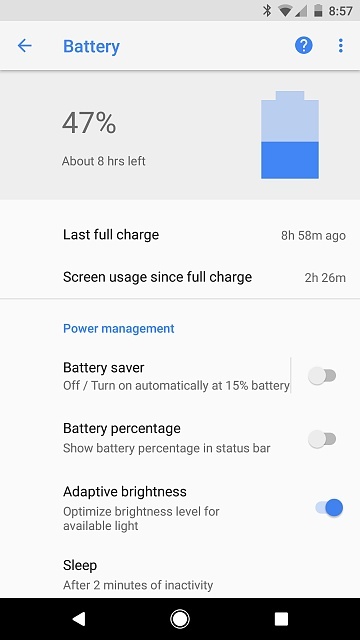 My battery life on Nougat was very solid, on every full charge I get 6-7 hours of SOT. Now, I'm getting less than half of that (about 3 hours). Is it just me or are u guys having the problem? Having same issue. Unplugged my phone this morning and 1 hour later was down to 96% with no use. 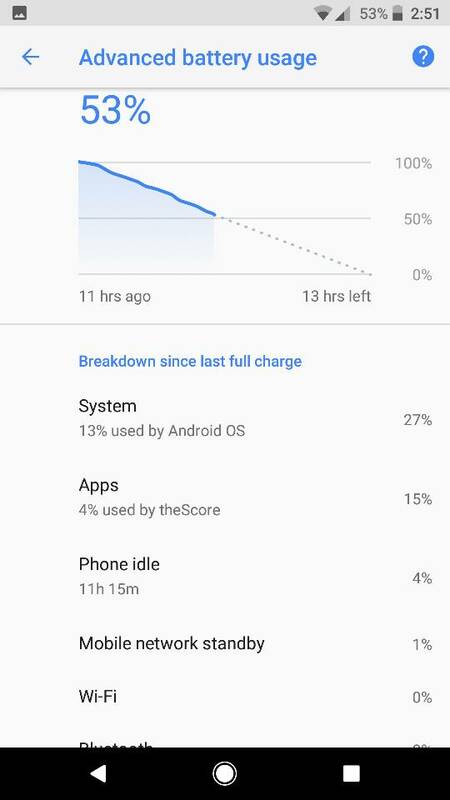 I noticed almost immediately that my battery wasn't draining as fast - it lost about 2% in an hour instead of the previous 5-8%. 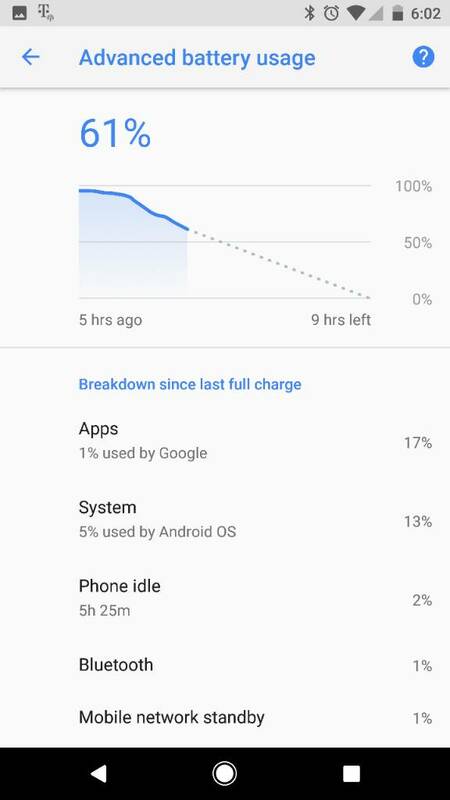 Went to bed last night - woke up this morning, 8 hours later, and my battery had dropped a TOTAL of 4% overnight. I plugged it in when I arrived at work to top it up, then took it off the charger an hour ago. Right now it's still at 100%. When I started seeing this, I reported it to Google through the feedback. That was Wednesday. Today my Pixel XL is a whole new phone. I am by no means a heavy user, but also a couple of days ago at this time I'd be down to about 40%. Not anymore. I am happy again. 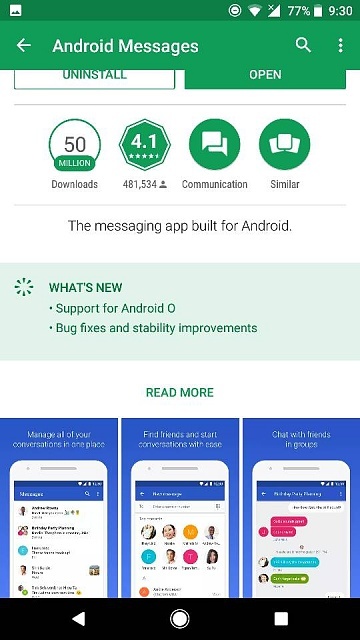 Oreo is killing me. And this is after a factory reset. I have been through many OS updates and it always takes a day or two to settle down. Mine is not better than before Oreo. I did find in Developers Options that Mobile Data Always On was turned on after the update. I turned it off and the numbers jumped up. Plus the phone lasted longer than the 5 hours predicted in my screenshot. So fingers crossed your two day prediction is working for me as well. We'll see in the morning. I am going to give this a shot, thank you for the tip! Mine seems to be ok. I did the full install and wipe. I also have not seen any or the Bluetooth issues being talked about. I don't really have any complaints with my Verizon Pixel on Oreo. I agree. 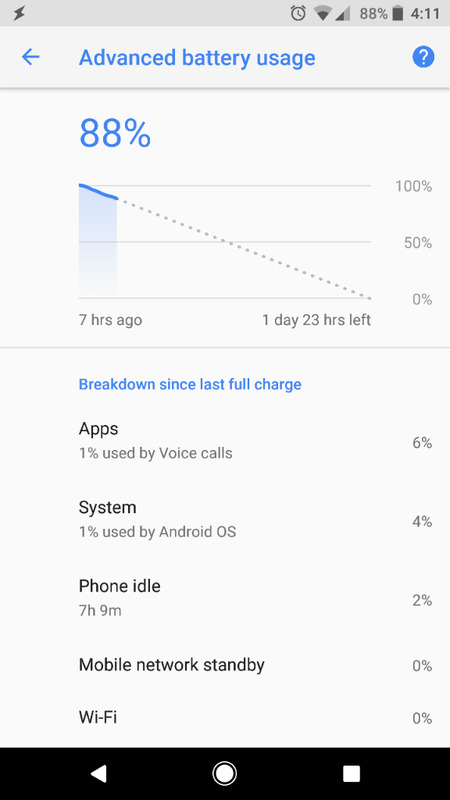 XL on VZW and I unplugged my phone at 3 am at 100%, woke up at 730 and it was about the same until I asked google assistant for the weather, used bluetooth in my car with google play. There was some chrome use and audible and im at 90% writing this. 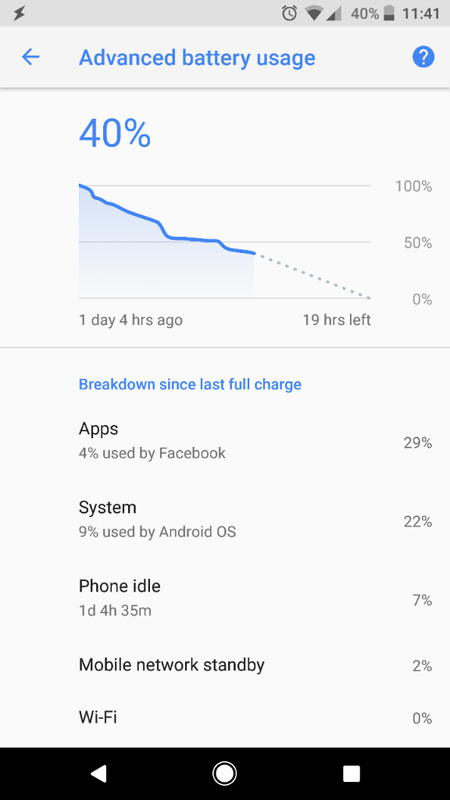 I use my phone all day for audible or google play, tiwtter and google feed and ill probably leave work at 5 or 6 with 60-70%. No location services on or wifi or BT. 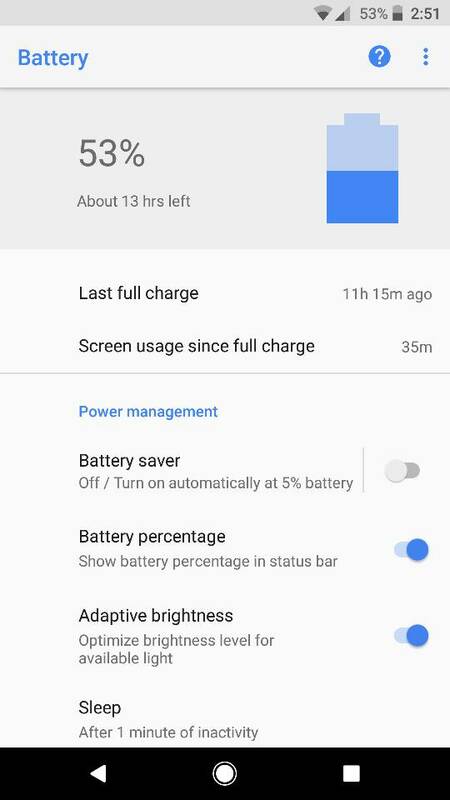 Ill tell you guys this much, this battery life puts most other android phones to shame. BTW - WiFi shows 0% - my WiFi is NEVER turned off. fludkilla and mmcclure0453 like this. Battery life still bad. One Bluetooth problem after another. My Pixel is fine. I don't have Bluetooth running except when I specifically need it. My 1998 Nissan pickup truck doesn't have Bluetooth. I normally power off my phone when I go to bed but last night I forgot. The battery was in the mid-sixties. When I got up this morning, after sleeping for six hours, it was 63%. mmcclure0453 and libra89 like this. Is this normal for the Pixel? 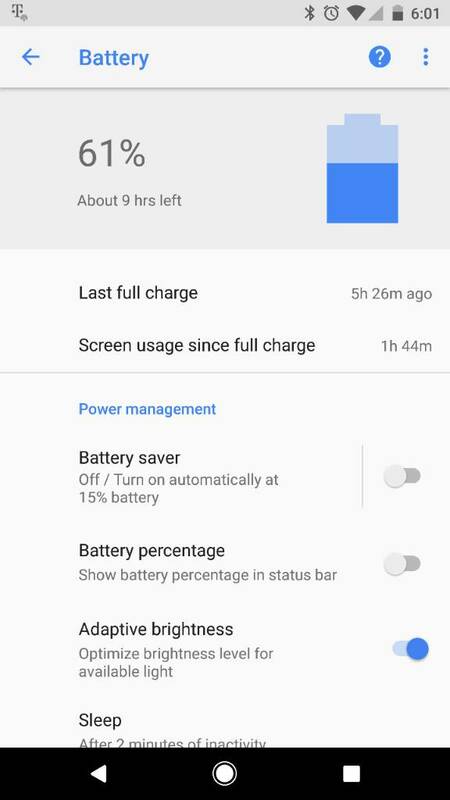 My battery life has taken a huge hit since the upgrade. 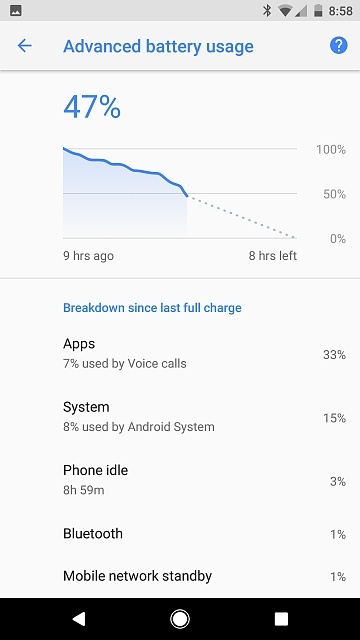 The OS and Bluetooth are the biggest drains at 57% and 17% respectively overnight when I was not using my phone at all. 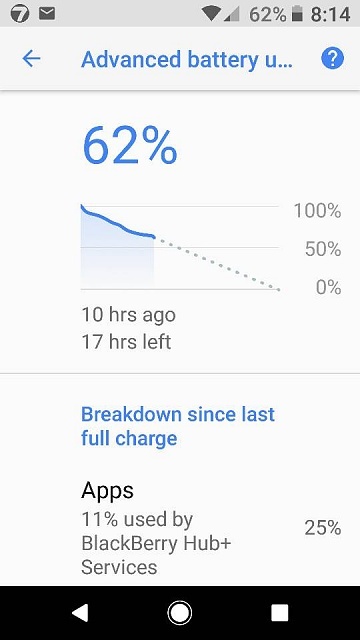 The phone had started at 90% before going to bed and was at 16% 7 hours later. The phone gets much hotter than it used to when playing any games, taking calls ans charging on a portable battery. I've cleaned out as much as I can and updated everything that had an update and it is worse than ever. I have never had to turn off my Bluetooth before but it looks like I have to now. Suffice it to say, I am very unhappy with this update. I am attached to a wire constantly which defeats the purpose. 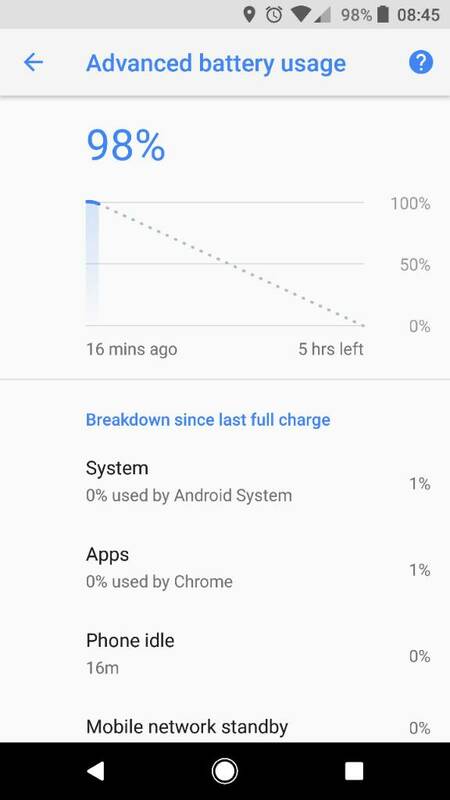 Help locating battery draining app!! Why can't I install apps after reset?